Kat Clay pushes her wish onto the lake at Loy Krathong. I WALKED UP A LONG dirt driveway, past half submerged houses to a guesthouse in New Sukhothai. I had booked the last room in an overbooked town, a thin mattress laid on a tiled floor. Past the unattended reception, on a long wooden table, were piles of marigolds, banana leaves, and orchids. The staff punctured foam with silver pins, sticking neatly folded leaves in intricate patterns along the edge. They handed me a base and invited me to join them. I wedged three incense sticks and some candles into the middle of the foam, surrounding them with haphazard yellow and magenta flowers. I finished my krathong with a circle of banana leaves. The Loy Krathong festival takes place every November across Thailand, over the weekend of the last full moon of the lunar cycle. The festival pays respect to the Goddess of Water, to thank her for the use of the river and ask for her forgiveness in polluting it. As the ancient capital of Thailand, Sukhothai is the centre of Loy Krathong celebrations. 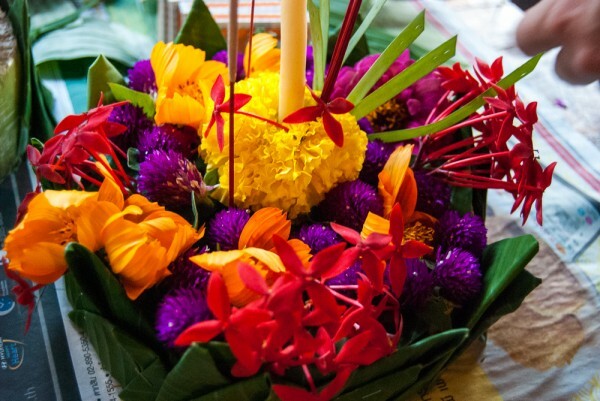 Krathong is the name given to the small, hand-made floats launched on the river to make a wish for the future. A woman handed me a small flag to add to my colourful creation. “Write your name and your phone number on it,” she said. Without a Thai phone number I’d lost my chance at true love, but my husband would certainly be happy. At twilight I hitched a ride on a rickety tuk tuk to the entrance of the world heritage site. Strings of lanterns guided me through makeshift alleys, lighting food stalls full of dried squid kebabs and chilli chicken. Through these alleys lay the ruins of Sukhothai; the great Buddha flanked by rows of columns, turning purple, blue, and pink. In the distance, candles spiraled up the sides of the great wats, as monks performed music in orange robes. Thai families looked on as paper lanterns lifted into the night. A firework exploded against the silhouette of the ancient Buddha, breaking the darkness in a thousand-point star. As a child I was terrified of fireworks; now I watched with a smile on my face. I was entranced by the magical properties of light, shooting to the stars, bright then dark again. Hundreds of krathongs floated gently on the lake, spots and strings reflecting in the darkness as fish made ripples in the water. The sounds of traditional music blended with the voices of families praying over their krathongs, before they pushed it into the water, fanning the air so it would go far and not sink. Wishes would only come true if the krathong stayed afloat; sunken wishes went unanswered. I carried my krathong down to the water in front of the ruins. Silently watching the floats move to the other end of the lake, I bent down at the edge and placed my krathong in the water. I whispered a wish over the flowered vessel. The candles took quickly to the flame. I pushed it further into the lake. At first it didn’t move, but a Thai man stroked the water behind it, taking care of my krathong. My wish began a slow journey through the night, joining the hundreds of dreams on the lake. A great sense of relief washed over me. As my wish floated away, I hoped it would come true.